Designed in conjunction with Terry Hearn the high modulus 6' (1.8m) handle is exceptionally light and rigid, with a slim reverse taper and woven finish, to match the Terry Hearn rods, along with an ergonomic textured grip. The spreader block is produced using a special glass filled engineering polymer, which is ultra-lightweight yet incredibly strong. It is securely pinned and bonded into the handle and includes an isotope slot. Extra-long 44" (113cm) arms made in the same material and finish as the handle provide extra reach and gape and feature machined and anodised aluminium fittings. 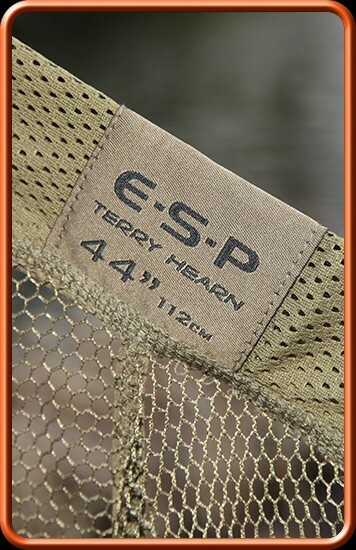 The 1.22m deep, super soft olive green mesh is perfect for retaining big carp in the margins.